The mists of fall have descended upon the Treasure Valley, and nestled inside one of the homes in Two Rivers a family snuggles on a giant L-shaped couch in the theater room. Studies have shown that the number one reason people buy homes is for the stability and comfort of their families. They also buy, because they want to live in a neighborhood that they enjoy. For the fortunate folks like this family, who recently bought one of the homes for sale in Two Rivers in Eagle, Idaho, the houses in this subdivision fit the bill and then some. In the subdivision of Two Rivers, real estate offerings fall into two categories. People who want a bit more privacy and to live in a home that feels more like a luxury resort opt to buy property in The Pointe, The Streams and The Islands, which are the gated communities within Two Rivers. On the other hand, people who want to buy a home that allows them to more readily mingle with their neighbors choose homes in the other parts of the neighborhood. Both options provide optimal living environments for the families who live in this neighborhood. Most homes in Two Rivers here are spacious to say the least. For people interested in keeping their extended families together, there's ample space to build in features like a mother-in-law area, complete with a space for tea when visitors come. For others, buying one of the homes for sale in Two Rivers in Eagle, Idaho means they have have the media room they've always dreamed of. Typically, the inside features of the homes resemble the neighborhood itself. If there's a winding staircase in the entryway of the home, then chances are good that it's constructed of a beautiful shale or slate that makes up many of the gates in the community as well as the clubhouse at the community's entrance. In fact, the clubhouse and pool in the subdivision give visitors here their first glimpse into the character of the neighborhood. Next to a bell tower lies a building that looks like a chalet in Switzerland. Nestled against a gently sloping hill, fronted by a small pond and adorned with immaculately landscaped greenery, this piece of Two Rivers real estate welcomes both residents and non-residents alike. With its ample yard, abundant great room with gas fireplace, gourmet kitchen and backyard pool and playground, this multipurpose facility welcomes neighborhood party-throwers, family reunion-goers and swimmers and sunbathers. Residents living in Two Rivers each receive keys to the facility, and on hot summer days will spend time splashing about in the pool. Deck chairs give people places to hang out and catch up with neighborhood friends while the playground/ jungle gym becomes the next dinosaur cage or spaceship in a young child's imagination. However, this place isn't just for people who have bought one of the homes for sale in Two Rivers in Eagle. By downloading a simple form on the neighborhood association website, the public at large can use the facility when they have an important event. With the subdivisions 41 waterfalls and 17 lakes, this neighborhood offers an ideal location for just about any occasion. And it's actually all the water in Two Rivers that makes this one of the gems of Eagle, Idaho. Many of the homes here have lakeside access and have private beaches in their backyards. But beyond this, the subdivision also provides ready access to those who want to stroll along the Boise Greenbelt or head out on a long bike ride. 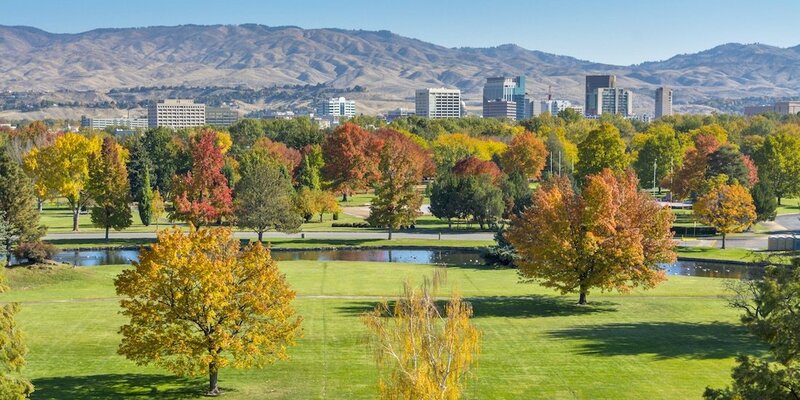 Eagle's sister city, Boise was called one of the "Best River Cities" in the country by Outdoor magazine, and one could argue that Eagle has earned this distinction now in its own right. Some of the best places to hang out in the City of Eagle like Bardenay Restaurant or the Breakfast Grill at the Hilton Garden Inn have enviable riverside locations and views. These two prominent city businesses share a parking lot and count among the most stunning pieces of Eagle, Idaho real estate. Two Rivers lies just around the corner from them, making a quick lunch with friends or an afternoon jog on the bike path an everyday possibility. As well, people who buy one of the homes for sale in Two Rivers in Eagle want what all new home buyers with families want -- an excellent place for their kids to go to school. The Eagle, Idaho schools CD Andrus Elementary, Eagle Middle School and Eagle High School* help build a bright future for the area's young people. Engaging lessons, excellent teachers and promising opportunities lie at the heart of the educational system in Eagle. For those who have moved here to take advantage of the many amenities that the city has to offer, these schools are some of the best places to start. However, it's not just in the realm of education that Eagle, Idaho offers real benefits. Located just a few minutes away from Boise, Meridian and Nampa, living in Eagle gives residents here important access to services like medical facilities --St. Al's and St. Luke's have both set up shop here -- but also because of its close proximity to those other towns, residents who buy Two Rivers real estate put themselves near the best that these cities have to offer as well. Additionally, major employers such as Hewlett Packard and Micron are in the area. The Treasure Valley has become a Silicon Valley in its own right, bringing plenty of opportunity with it. Gainful and meaningful employment also count as reasons why people buy homes in the places that they do, and Two Rivers in Eagle, Idaho speaks exactly to this most basic and important human need. But as the saying goes, all work and no play make Jack a dull boy. Fortunately, for people living in Two Rivers, there's plenty to do. Aside from all the biking, hiking and leisurely strolling they can do on the Boise River, Eagle Island State Park is just a few minutes away as well. Families can pack of the car for an afternoon of horseshoes, barbecue and swimming. Additionally, plenty of people living in the city love the game of golf, and it's almost as if the City of Eagle was made for them. Eagle Hills, Falcon Crest and BanBury all lie within the area. Aside from offering well-manicured greens and driving ranges, these facilities function as cultural hubs in Eagle. Wine tastings, golf tournaments and other events serve to bring the community together and count among the many reasons why people choose to buy Two Rivers real estate for sale in Eagle. *Schools subject to change. Not guaranteed.